Do you remember those sweet chocolate peanut butter bars Mom used to make? 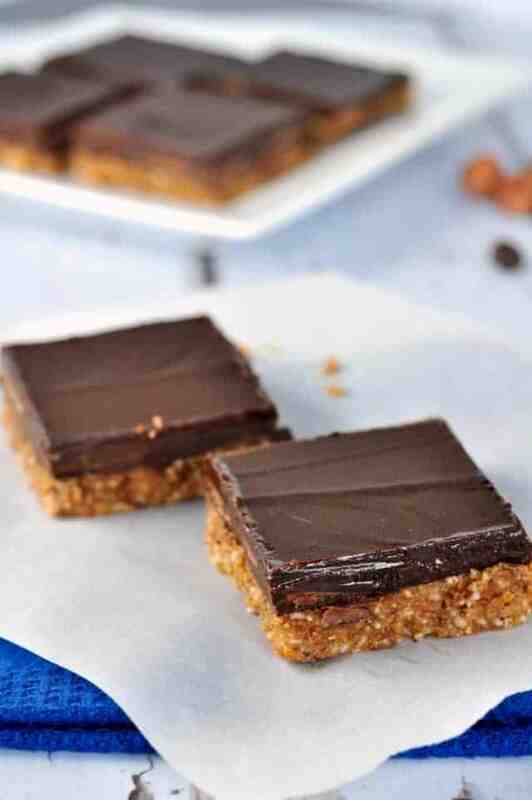 Try these Chocolate Almond Butter Bars for a healthier version of an old favourite. No baking required! I spent the day in the kitchen today, making these Chocolate Almond Butter Bars and editing photos of things I’ve baked. While doing so, I flipped through some old pictures. Have you ever looked back in your photo library to see what you were doing exactly one year ago? 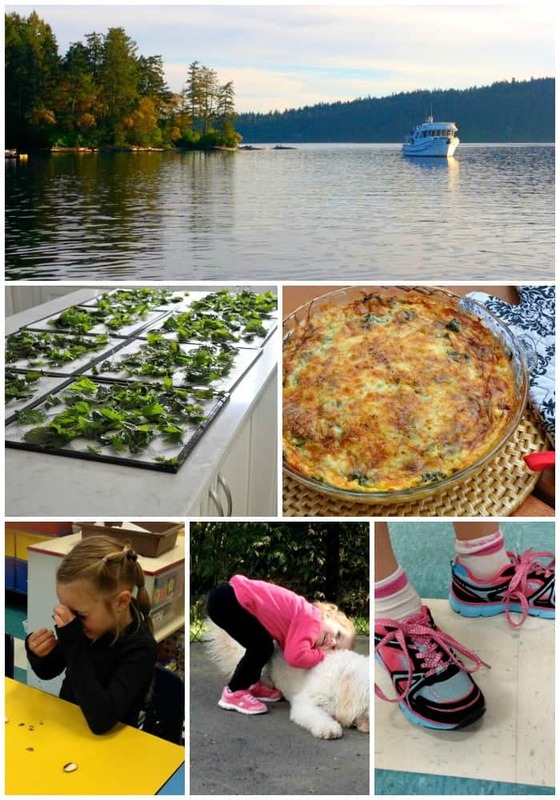 stinging nettles and making a nettle quiche. At school, my Grade Ones were studying the parts of a bean seed, growing beans and reading Jack and the Beanstalk. Halle was loving her crazy pup, and Lexi had mastered the art of shoe tying! And this year, this is what we’re up to! 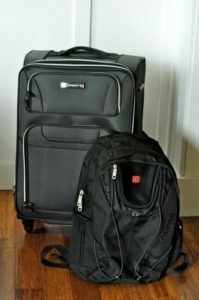 We’re squeezing everything we can into our bags, checking their weight, and seeing what else we can transport to Laura who is setting up a new home in Prague. Can you imagine how excited I am? In the meantime, I’m counting the days and passing the time by baking, or at least creating in my kitchen, as these Chocolate Almond Butter bars are a no-bake recipe. Quick and easy, they’re a grain-free, dairy-free indulgence. 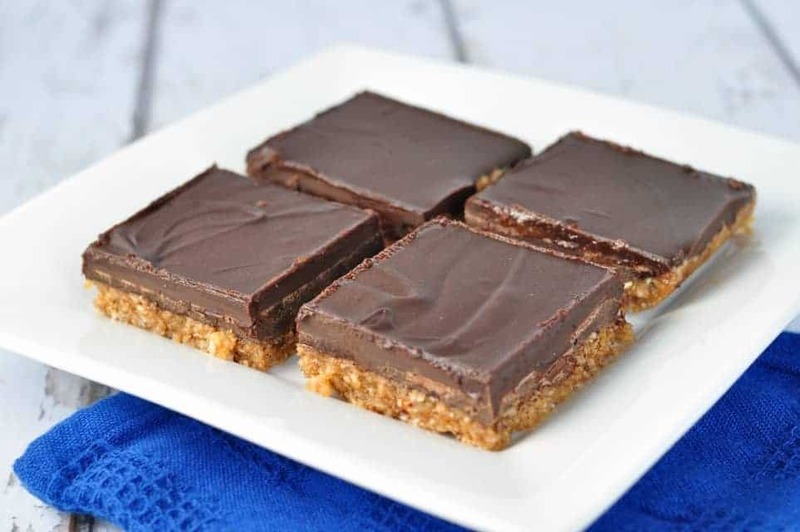 Do you remember those chocolate peanut butter bars that were always on a sweets tray at every holiday party, baby shower or funeral you attended? Made with lots of butter, peanut butter and icing sugar, they tasted good, but this almond butter version is a much healthier indulgence and is just as tasty. 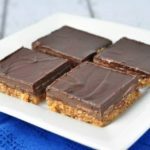 And if you want a healthier peanut butter version of this recipe, try these no-bake chocolate peanut butter bars. Perfect for an afternoon snack, or for tea with a friend! Make the base by combining the ingredients in your food processor, chill it while you melt some chocolate, spread the chocolate on top, and return the pan to the refrigerator before scoring it and cutting into squares. These bars also freeze well. Have one, or two, then sneak the rest into the freezer for another day. 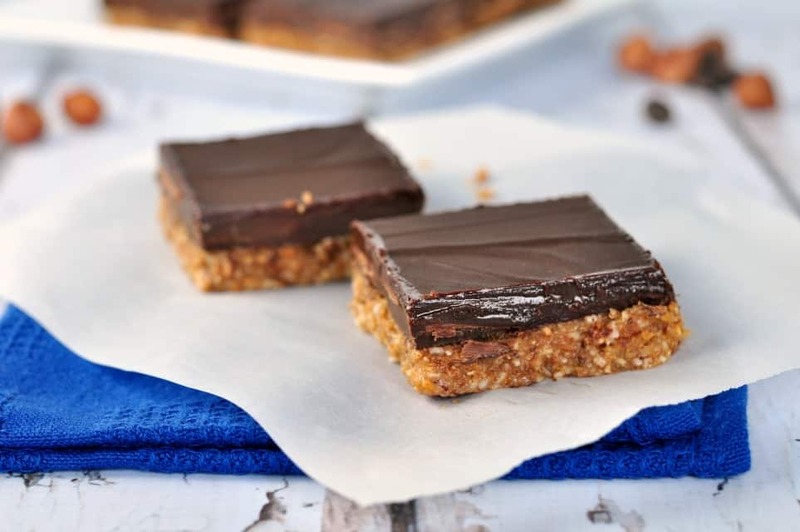 A delicious no-bake paleo Chocolate Almond Butter Bar, reminiscent of the Chocolate Peanut Butter bars Mom used to make. Pulse nuts in a food processor until finely chopped, then add the remaining ingredients except the chocolate chips. Press into a well-greased (or parchment paper-lined) 9 x 13 inch baking dish, spreading evenly right to the edges. Chill in the refrigerator while you melt the chocolate. Melt the chocolate over, not in, boiling water. Remove chilled base from the fridge and pour the melted chocolate on top, spreading to the edges. Return to the fridge or freezer to set. To avoid having the chocolate crack when you cut into bars, let the pan sit for a while. Cut by dipping a sharp knife into hot water, scoring the bars into the desired size, than cutting all the way through on the score lines.